February 26, 2009- At 07:52 Stations 1 & 2 were dispatched to the area of 233 West Second Mountain Road, North Manheim Twp, for a motor vehicle accident with unknown injuries. As Duty Chief 723 (Donatti) arrvied on scene, he found a 1 car MVA with the vehicle on its roof with the occupant already out of the vehicle. Chief Donatti had all incoming units come in normal flow do to the icy road conditions. All units were on scene for roughly a half hour until State Police and the towing company arrived. 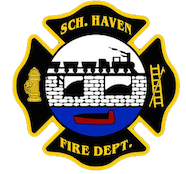 February 23, 2009- At 21:49 all 3 Haven stations were dispatched to 98 St. James Street, Schuylkill Haven Boro, for an unknown type fire. As everyone went en route it was found to be a small brush fire behind the Bleachery. Chief 723 cancelled off station 1, stations 2 & 4 took care of the small detail and were placed available in just over a half hour. February 22, 2009- At 03:38 On Duty Chief 723 (Donatti) was dispatched to 408 St. John Street, Schuylkill Haven Boro, for a carbon monoxide investigation. While Chief Donatti was en route he asked to have Station 2 dispatched to assist him at the scene. As everyone arrived on scene and did an investiagtion it was found that there were very high levels of CO throughout the residence and the homeowners were exposed to it for a period of time. Chief 723 asked to have Medics expedite to the scene, and once they got there it was decided that they were going to fly out 2 of the victims from the residence. Stations 1 & 4 were dispatched to "The Island" to set up a Landing Zone for incoming Medevac 7. While they were waiting for the chopper to come in, they were called by county stating that they will not fly do to weather conditions. Station 1 was then placed available, while station 4 was asked to go back to St. John Street to assist Chief 723 and station 2 with ventilation of the house. All units were eventually placed back in service after 5 AM. February 20, 2009- Just before 2pm stations 1 & 2 along with District 41 (Cressona) were dispatched to the entrance to the Cressona Mall at 1530 Route 61, North Maheim Twp for a motor vehicle accident with entrapment. As units went responding, County Comm. Center advised of a mulitiple vehicle accident with at least one vehicle laying on it's side. There was a total of 4 vehicles involved in the crash and 2 patients had to extricated from their cars. Do to the serious conditions of the patients, Medics advised that Medevac 7 would be needed. Moments after the first incoming units arrived, Liberty Station 4 was dispatched to set up a Landing Zone right at the Cressona Mall parking lot. February 19, 2009- At 10:00 the SHFD was dispatched to 350 Route 61 South, North Manheim Twp, (Van Huesen) for an Automatic Fire Alarm. Once again, before any units could arrive on scene, they were cancelled off do to a false activation. February 17, 2009- At 19:34 Stations 1 & 4 were dispatched to assist District 41 (Cressona) on a possible house fire at 13 Marsha Drive, Cressona Boro. Engine 737, Wagon 736, and Ladder 725 went responding within minutes, but before they could reach Cressona Boro, they were placed available by Incident Command, Chief 41 (Mansell). Time out was 5 minutes. February 13, 2009- Just after 10:00 stations 2 & 4 were dispatched to 275 Berne Drive, South Manheim Twp, for more trees down. Duty Chief 720 arrived on scene only to see a rather small tree hanging off wires. Chief Peel cancelled off Engine 732 en route and Engine 737 and crew took care of the small tree and were cleared in 20 minutes. February 12, 2009- Right at 12:00 noon, Chief 720 was dispatched to 120 Parkway, Schuylkill Haven Boro, for a special assignment. As Chief Peel arrived on scene he had noticed that do to the strong gusts of wind, part of the roof to the residence had blown off. He had asked to have Ladder 725 and Engine 737 to assist him at the scene to try to repair the roof so that the rest did not blow off. Crews were on scene for nearly 1.5 hours. February 12, 2009- Just before 05:30 Chief 720 (Peel) was dispatched to the area of 546 Berne Drive, South Manheim Twp for a tree down. As Chief 720 arrived on scene he asked to have Station 4 for Engine 737 to assist him at the scene, as it was a large tree blocking the roadway. The crew from 737 cut up the tree and were cleared within 1.5 hours.